Synopsis: The oft-whispered Toymaker that made the Puzzle Box for Leviathan’s side of Hell is explored, while revealing the Toymaker’s bloodline was intimately linked with those events. • Lemarchand and his descendants (Bruce Ramsay) were genuinely interesting characters in the opposition to Leviathan’s Hell, revealing that the Toymaker was not the loon history suggested. 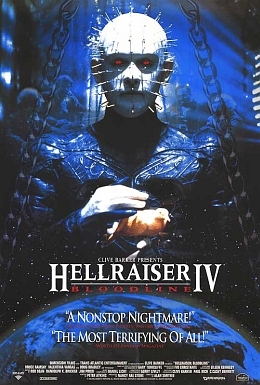 • Doug Bradley was more than game to continue Pinhead’s story, while fully showing the evolutions of the character created in the prior films. He was a primary antagonist here, but the echoes of his human past ensured he was the best part of the film. • Angelique (Valentina Vargas) was a fascinating character, being an equal to Pinhead yet somehow more pure. The mystery surrounding her existence prior to being “born” on Earth successfully ensured an enigmatic nature that Pinhead now lacked. • The centuries-long story was overall engaging, in spite of the poor implementation. • Perhaps the worst implemented nonlinear timeline in cinema. Having the part of the story set in the future be the frame story destroyed the pacing. • The film’s flashback implementation took away the cyclical elements that subtly drove the prior films. • Pinhead’s character only seemed to have significant depth via the viewer’s knowledge of the prior films, as none of the characters were given much time to be explored. Indeed, the film does not stand well on its own. • Reasoning on why Dr. Merchant (last descendent shown) was being arrested seemed vague and unnecessary. • The changes done to the film during its production bled through in abstract ways that fueled all the negative elements, making the viewer wonder how much better it would have been if the producers did not force significant changes. John Merchant — For God’s sake! Pinhead — Do I look like someone who cares what God thinks? At the end of Hell on Earth (1992) we were given a hell of a tease. It seemed the old Puzzle Box somehow created an entire building it its likeness. What did that mean? How was that even possible? Those questions were at the core of Bloodline, while they were used to provide the history of Lemarchand (the Toymaker) and how his descendants were cursed to cross paths with the denizens of Leviathan’s side of Hell. It was a genuinely satisfying reveal on the truth behind the eccentric building: Lemarchand’s descendent was called by the entombed box, while he was trying to complete his ancestor’s work, which he eventually learned was about closing the gateway to Hell. Leviathan’s Demon Princess Angelique, Pinhead, and the Lemarchands/Merchants were a glorious unholy trinity that had the power to end reality as we knew it. Yet, they never aligned for arguably mysterious reasons. The film did have a great story that nearly tore itself apart via its implementation.